HARIDAS: Arthur was here, he is an Ascended Master the same as Merlin. Arthur was here incarnated in a human body to bring together a group of people to hold the light and to hold the love energy on this island during a very dark period of time in history. Arthur was trained by Merlin. Merlin was his teacher and mentor. Merlin was not very easy on Arthur, and he did really learn the hard way. Merlin once told me when I was down in Tintagel that anywhere Arthur lived and had castles, they were all known as Camelot, The reason was that when anybody asked where Arthur was, the answer was always, “He is in Camelot.” And nobody knew which Camelot anybody meant. So it was much harder for them to find him, because all the time they wanted to dispose of his body on the planet so that the light that he would hold would diminish and things would again become not so easy. It was a big struggle, but Arthur took it all well. Many things happened in his life which tried to take him off the course of holding the light. ARTHUR: I am Arthur, known to many as King Arthur. For each and every one of you I welcome you to one of what you may call the Cities of Light, for understand that my castles that were known as Camelot were really cities of light. Inside the castles were many different people, at different levels of the social system. They were places of much trading, places of teaching and sometimes places of much fighting. So welcome to this Camelot that you now know as Cadbury Hill. The one through which I speak has given you some of the background of why there were so many places known as Camelot. And the words that Merlin spoke to him those years ago are correct. All my castles were known as Camelot, and all the castles were castles of the City of Light, and not only was this City of Light in this dimensional reality, but there was a reflection through higher dimensional realities. It might be interesting for some of you to know that these cities of light or these castles of light were also connected with that place in time and space that many of you would know as Shamballa. They were not at that time connected with the multidimensional cities of Shamballa or the multidimensional light centers of Shamballa or the multidimensional cosmic centers of Shamballa, but the Shamballa of the fifth dimensional reality. For understand that in those times, when I Arthur, Merlin and Guinevere and the others, the shining knights of the Round Table were incarnate, there was not for most people a very strong connection with other higher dimensional realities, or with higher vibrations than fifth dimensional reality. The fifth dimensional realities, verily is the reality of light. It is there that many humans travel after they quit their physical bodies, if they do not take up residence in their illusionary heavens in the seventh level of the astral realms. Fifth dimensional reality is also a lace that still can have a strong pull to third dimensional reality, and many, again through that pull, make the choice of incarnating again into human bodies. I Arthur was the keeper of a sword which many of you would know. It’s name is Excalibur. The sword Excalibur was not a sword of steel, a sword of metal. It was a sword of crystalline light, and this sword of crystalline light was used by me to cut away the darkness so the light and the love could shine through that darkness and into the hearts of human beings that were willing to accept it. This crystalline sword of light has many, many aspects, and each and every one of you, if you wish, could take one of these crystalline swords of light, and with it you could cut away the darkness that sometimes surrounds you, for you must have heard it said that when your light shines bright, the darkness can be very dense. Around the edges of your light there is a shadow area named blackness. As you expand your light, your lightbody, the darkness retreats, retreats into a bigger circle around you, but there are times when all ones think, “How can I deal with this oppressive energy that is around me? How can I deal with the darkness that I encounter on my journeys through life?”—whether that darkness is spread by someone else or whether that darkness is held in a building or a place. With this crystalline sword of light you can cut away, you could hack away, you would choose. And you could liken it in some ways that if you encounter darkness you could use it to make a path through it at least just like cutting a path through a tropical jungle. So for each and every one of you I would like to give you a sword of light. We will make a journey down into this vortex. I will take you on a journey, for down inside this hill and also above this hill in the realms of light still exists Camelot. It is only those that cannot see its finer vibrational energy that would insist that it does not exist here. So focus upon your breaths, my friends. And as you focus upon your breath, I activate your lightbodies. I increase the counter rotations of the geometric shapes around your physical bodies. And I increase them, and increase them, and increase them until you are vibrating just below the speed of light, and as this vibration, this counter rotation increases, see the light, feel the light, be the light. As you breathe in, feel love, feel light flooding into the whole of your being. 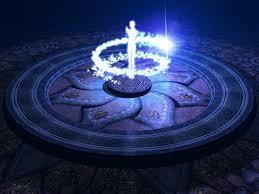 So now I Arthur open up this vortex, and we take you down through the circling energy. Do not fear, my friends, for you are safe in our hands as we circle and swirl downwards, downwards, downwards into the vortex, and as we come out into the hill see the crystalline Great Hall. This Great Hall is constructed with blocks of living, pulsating, vibrating crystal. These vibrations are the vibrations of light and the vibrations of love. Feel these vibrations of light and these vibrations of love activating your lightbody, further integrating with the geometrical shapes within which you are travelling. And if you look around this crystalline Great Hall, you will see me, I Arthur and also Merlin. And look around you now, and see these great blocks of crystals, in which is embedded these crystalline swords of light, these crystalline swords of love. I would ask you each and every one of you, to step forward and claim your sword. Now just pull this sword from this crystalline block and hold it in your hands. Feel the pulsation, feel the light. These swords of light, these swords of Jedi. They can be activated or deactivated. They will never run out of energy. So, these crystalline swords of light are yours to keep forever. May they accompany you on your journeys, in you life, in your work, in your play. And now I pass you to Merlin. I Arthur for this moment bid you farewell. It may be that I speak with you again, it may not, through this one at this time. MERLIN: Good day, I am Merlin. Merlin the magician. The magician of these Western Isles, the United Kingdom. Merlin, teacher of Arthur, holder of the magical energies in these places. Holder of the magical energies in these times. It was planned that Arthur would speak to you, but this channel spoke words about the Holy Grail on Glastonbury Tor, and it was then that it was agreed that when we came here, and you entered the crystalline Hall of Light, that we would help to integrate your Grail and fill your own Chalice with love and light. So Let us stand in a circle in this hall, and see in front of you, rising from the floor, a Grail of pulsating silver…and gold…and crusted with gemstones, precious and semiprecious. Rising, rising up until the lip of the bowl of the chalice is above your heads. And now let us start filling this chalice with love, with light, with gold, silver and violet, the energy of Mahatma, the I AM Presence of Mother/Father Source. Just see, feel, allow, imagine this Mahatma energy flowing into the Grail and overflowing, and as the excess overflows, see it flowing downwards into the body of the Earth Mother, so that she may also receive and absorb this love. And for each and every one of you now, just see, feel, allow, imagine this Grail splitting into a number of individual grails, one for each and every one of you. And as this Grail splits into individual grails, see these grails coming to you, and the base of the grail integrating with your solar plexus….the stem of the grail going from your solar plexus through to the center of your heart, and the bowl of the grail filling that Higher Heart Chakra, the thymus gland. And still, for each and every one of you is an outpouring of the Mahatma energy of unconditional love—silver, golden, violet—and now I Merlin bring more of this Mahatma energy, so that each of you may feel it in your own heart, and as it flows into each individual heart, feel it, see it, allow it, imagine it…feeling it flowing into the hearts of all men and all women that are incarnate on the planet. And as this love continues to overflow through your chalice in accordance with divine will, let us let this love flow through Mother Earth to all troubled places, to places where the people are troubled, where there is war, strife or famine, and also to the places where the body of Mother Earth is troubled. So now again let us return to the Great Hall, and from the Great Hall I will travel with you up through the vortex and back out onto the top of the hill, so that you may again merge with your bodies physical; and as we travel up just feel, see, allow, imagine this Grail becoming firmly integrated within you. And as you are back into your bodies on top of the hill, just feel that Mahatma energy that unconditional love, that silver, golden, violet flowing through your crown chakra and filling this grail and permeating every cell, every molecule, every atom, every subatomic particle of your body physical. My friends, you are becoming enlightened. Remember this. People will see more light around you. People will either approach you or avoid you. Blessings, my friends. Enjoy them. Allow the magic into your lives, for your lives are magic. When you allow the magic to flow, magical things happen. I Merlin leave you in magic. Goodbye.